Dorie Greenspan is a baking genius. Her tome Baking from my Home to Yours is the go-to reference for just about any kind of baked good you can imagine. In fact, thousands of bloggers baked their way through it Tuesday after Tuesday. However, I was intrigued by an article she wrote in Food & Wine Magazine about savory cookies, which she and her son Josh made for their CookieBar pop-up shop n New York. Perfect for cocktails, she claims. 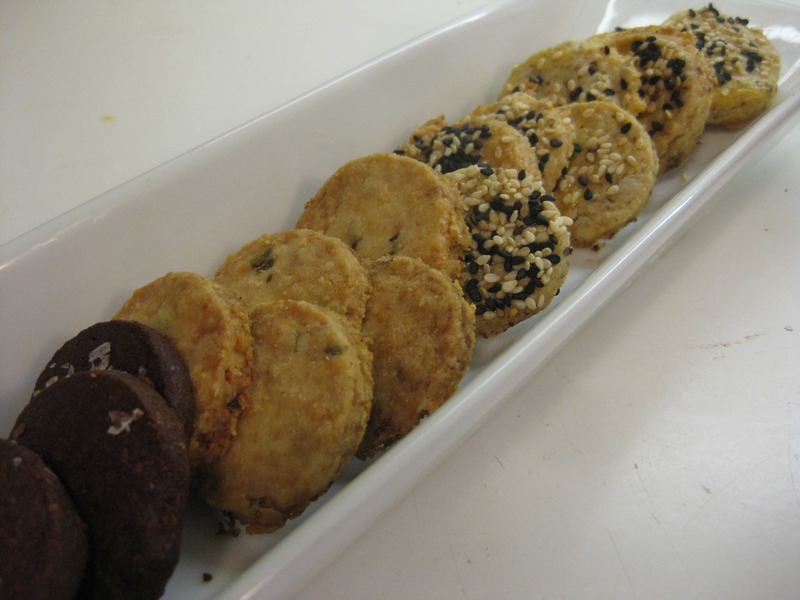 I’ve been trying various savory cookies in anticipation of a big party I was cooking for this past weekend. The rosemary pine nut cookies and the Parmesan wafers with poppy seeds I made last month were both delicious but didn’t hang together as an ensemble. 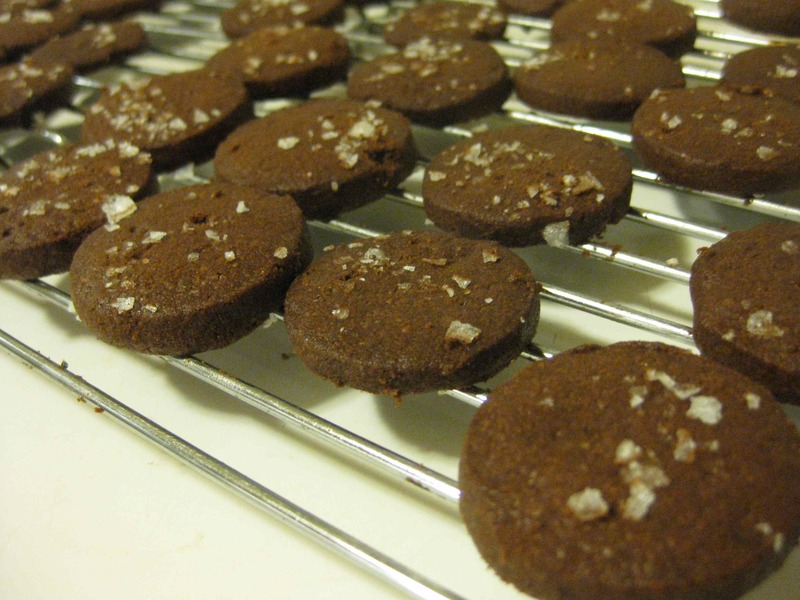 So I tried three of the five that Dorie featured in the article: chocolate-cayenne, rosemary-almond, and sesame seed. Cut in 1¼-inch rounds and stacked on a three-tier stand, these addictive little slightly sweet but mostly savory cookies were a big hit. I promised people at the party that I would provide the recipes, so I’ve linked to Food & Wine. A note about the recipes, which I had to adjust. Since I made the chocolate first and it turned out perfect — rich chocolate shortbread with a kick from cayenne pepper and flaky salt on top — I assumed that the other two recipes would be perfect. Not so, but I made an adjustment that worked just fine. The chocolate version was a typical recipe with butter eggs, sugar, flour chocolate, seasoning. The rosemary-almond was delicious and crumbly, which I attribute to the fact that my egg yolks – from local free-range chickens – were on the small side. 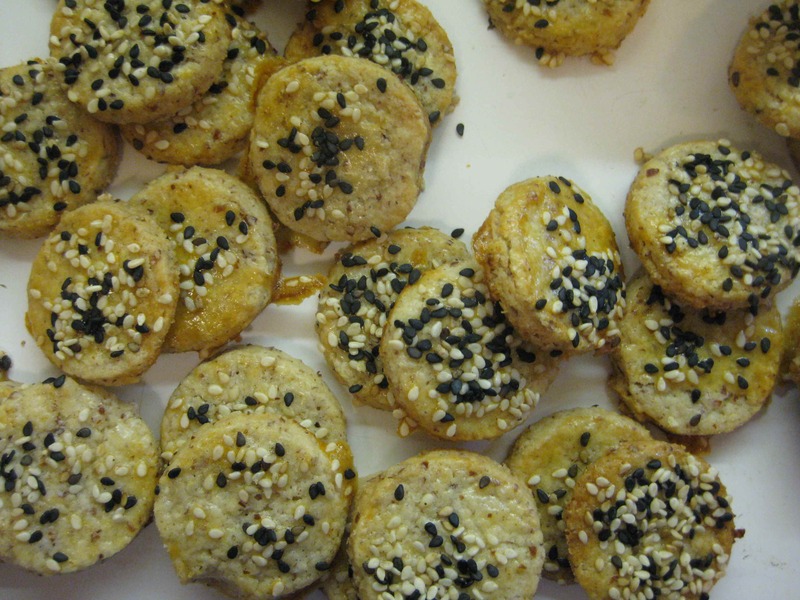 However, the sesame cookies, which are shortbreads – meaning no eggs – were made with a combination of almond meal and all-purpose flour, which can vary in absorption rate. While I had forced the rosemary-almond cookies to coalesce by kneading it — most of the cookies held together – I simply couldn’t get the dough for the sesame cookies to hold together, so I added a beaten egg to the dough in addition to brushing the cookies with a beaten egg to “glue” on the seeds. The results were great. A technique that made these work was to roll the dough between two pieces of parchment paper (Dorie called for waxed paper, which I didn’t have) and to freeze the dough for an hour to firm it up before cutting out and baking the cookies. This also allows the dough to be frozen for another time, in which case it would need to be thawed slightly before baking.